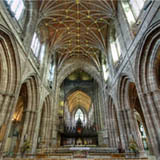 Chester 360° - History of Chester, Roman, Saxon, Tudor, Georgian, Victorian. Chester is an International Heritage City. 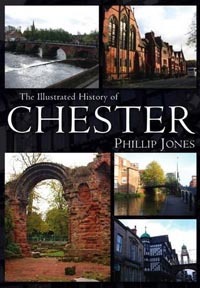 This page gives a brief introduction to Chester's unique history. 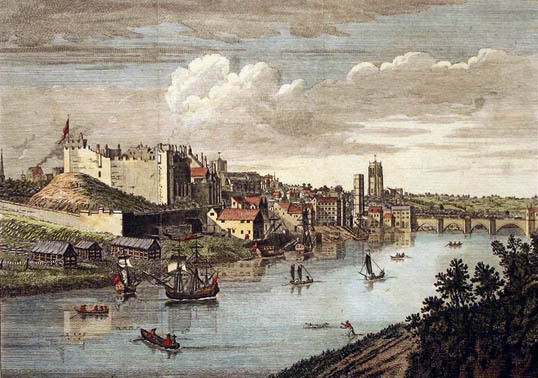 Chester became the largest port in the north west of England in the Medieval period. Today you can still see evidence of the Medieval period, the stone narrow bridge across the River Dee to Handbridge was the only river crossing into Chester (Old Dee Bridge). This was the lowest bridging point of the River Dee until the new Victorian bridge of 1839. Panoramic Photo of The Old Dee Bridge. 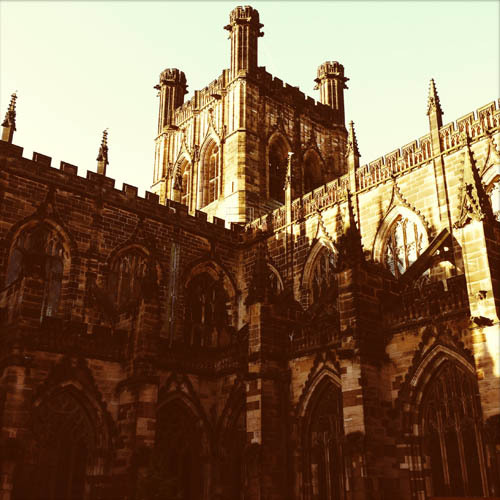 Chester Cathedral and the city walls we see today were built in this period. It reflects the wealth of Chester at the time. Three Old Arches - The oldest surviving shop frontage in Britain. The three arches at row level in Bridge Street are some of the earliest structures to be seen in the famous Chester Rows and provide a vital clue to what Chester's medieval stone houses looked like from the street. The Bear & Billet Inn (earlier the Bridgegate Tavern). A beautiful Tudor building located at 94 Lower Bridge Street. Built in 1661 it is now used as a public house. John Lennon's grandmother was born in the Bear & Billet in 1873. Tudor buildings were typically constructed using English oak timbers then painted with black tar for protection from the weather. The white paint you can see is wattle and daub then painted with lime wash. Other Tudor characteristics include: small leaded glass windows (large panes of glass could not be made then), overhang upper floors (called a jetty). There are many buildings in Chester that look Tudor, only a few are genuine, many are Mock Tudor built by the Victorians (still very old!). Here are some black and white tudor pubs. Can you tell which are originally Tudor? Many are a mixture of different building styles because over the centuries they have been extended, repaired or rebuilt. Stanley Palace (Built 1591) - Watergate Street, Chester. Formerly named Derby House. 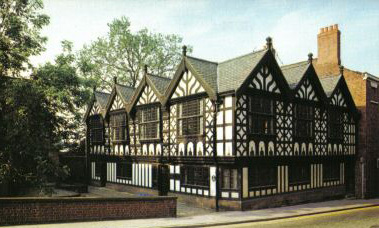 This Grade II listed timber-framed building is now owned by Chester City Council and managed by the Friends of Stanley Palace. 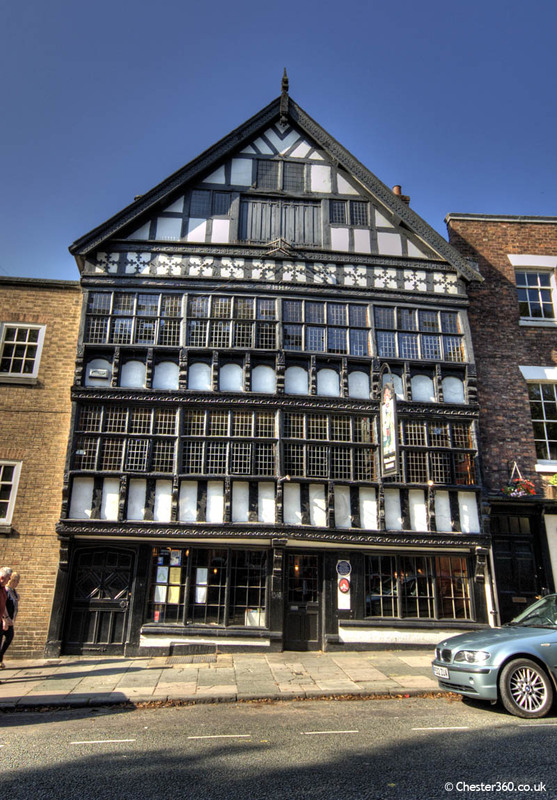 It is said to be the most haunted house in Chester! (above) Old drawing of Stanley Palace. Watergate Street. 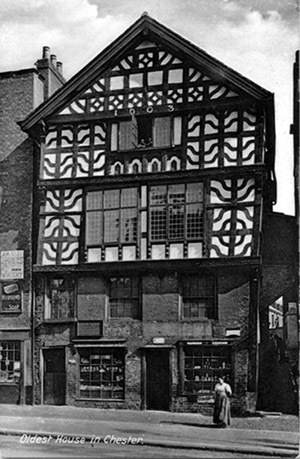 (above) Tudor House (1603) - Lower Bridge Street. This is one of Chester's oldest houses. There was once a walkway (row) on the first floor which was later bricked up to create a front room. 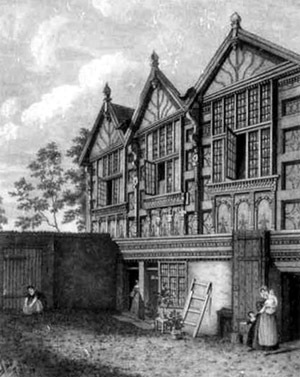 The Georgian Sash windows on the first floor were added later and are not Tudor in style. Royalist armies battled to keep the stronghold of Chester. The Battle of Rowton Heath took place some 2 miles to the south east of Chester on 24th September 1645, within sight of the city defences. This was a mainly cavalry action lasting sporadically over a whole day and extending across at three main locations, as the royalist forces were forced to fall back towards the city. Viewing the battlefield from the Phoenix Tower on the walls of Chester, Charles I saw his last substantial body of cavalry comprehensively defeated. The battle of Rowton Heath destroyed the tattered remnants of the royalist cavalry and ended Charles hopes of uniting with Montrose’s forces in Scotland. Though unbeknown to Charles, prior to Rowton, Montrose had already suffered a crushing defeat at Philiphaugh, and thus the royalist cause was already doomed. Please see our separate page for Georgian Chester. 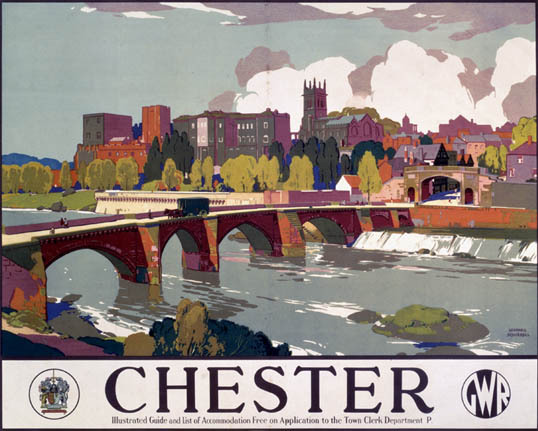 On 1st August 1848 the Chester General Railway Station opened. This is the station we see today. One of only 22 listed railway stations in the whole of England. 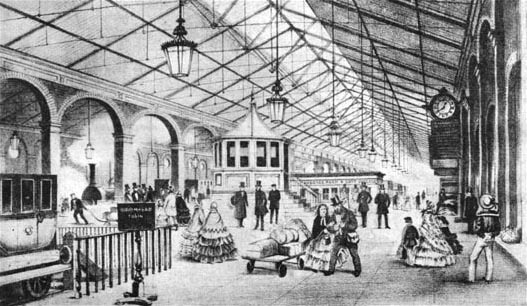 The new railways enabled Victorians to travel and Victorian leisure boomed with popular holiday destinations in North Wales and Blackpool. 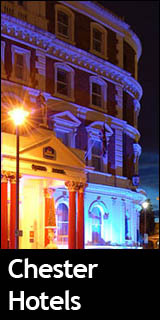 In 1860 The Queen's Railway Hotel, opposite Chester General Station was built. The Dee bridge disaster was an English rail accident that occurred on 24th May 1847 with five fatalities. 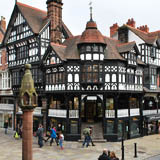 more..
See also our postcards of Chester from Victorian times to the 20th Century. 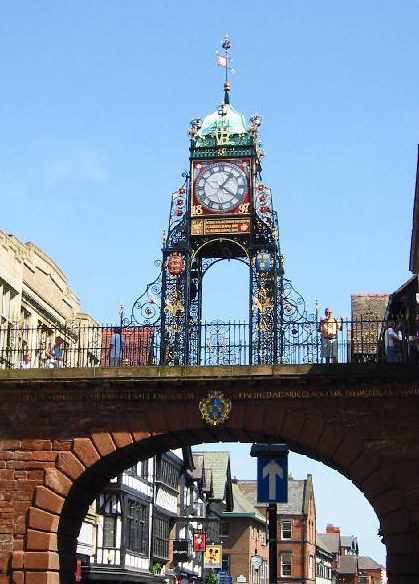 The Eastgate Clock (above) was built at the end of the 19th century to commemorate Queen Victoria's Diamond Jubilee. Originally this gate was the main entrance to Chester. Other gates existed on this site before this one we see today. Outside the Chester Town Hall Tourist Information you can see an early Victorian British Postbox. Mail services were transformed in Victorian times into The Royal Mail we have today. With the arrival of the railways and the opportunities for quicker mail delivery that they afford, the last London-based mail coach makes its final journey. Horses are still used for mail delivery in certain areas of the country. Changes in the availability of stamps mean it is no longer necessary to go to a Post Office to send a letter. Stamps can be purchased and saved until they are needed. This also makes it possible to have boxes in the street into which people can deposit letters they wish to send. 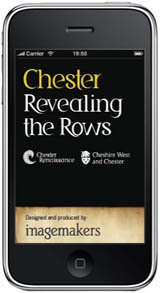 A detailed site detailing the history of Chester. The history of the city of Chester is so much more than the occupying Roman Legions and the walled fortress that they built on a sandstone outcrop overlooking the River Dee. 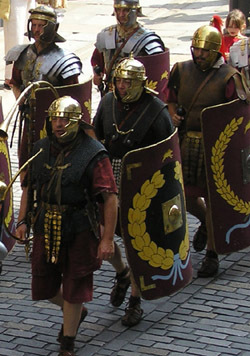 This book tries to investigate the very earliest settlement of the site prior to the Roman invasion, as well as looking at the various periods of settlement, notable characters and important events that have helped to shape the city that stands today.